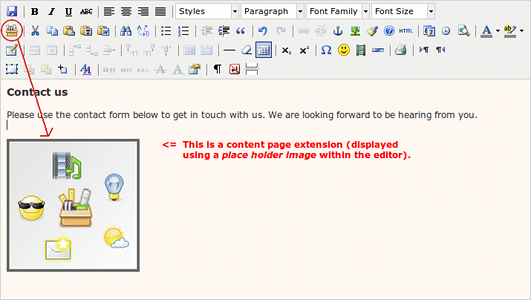 A page extension is an extension that can be added directly to a content page from within the page editor. We use this when adding an image gallery or a contact form (see image below). // it behave differently depending on the value within this variable. Read the comments in the code sample above for an explanation. Now let's write the actual page extension responsible for adding data or functionality to our content page. Notice that we made a few decisions regarding filename and class name when we registered the page extension in the code above - the file must be named Greeting.class.php, and the contained class must have the name of the extension folder followed by Greeting. Again, please refer to the comments in the code sample for an explanation. It should be quite easy to understand. The argument is commonly used when the same page extension is registered multiple times. The argument can then be used to tell the page extension how to look and behave.